Join our 2019 Room to Read World Change Challenge to give education to girls who need it in Asia and Africa. Our goal? 50 Australian Schools Supporting 50 Girls in the World’s Poorest Countries for One Year of Education. $1 a day or $365 per school. Find out more here! I’m proud to be a Room to Read writer-ambassador. 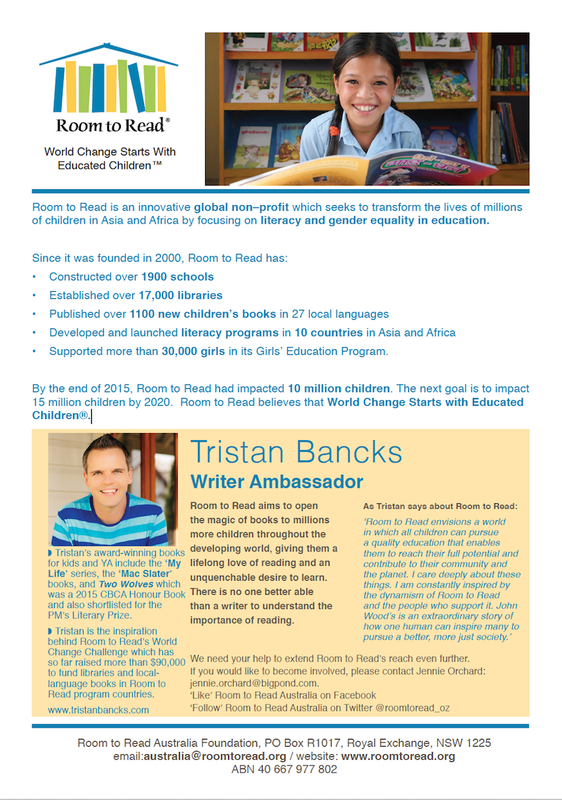 In 2012 I helped initiate the Room to Read World Change Challenge (with funding and support from Stubbies Schoolwear) and, since that time, in partnership with school students in Australia and Hong Kong, and the Room to Read writer-ambassador team we have raised over $120,000 to fund school libraries, local-language book publishing and girls’ education in some of the world’s poorest countries. Our short film for SBS: Change the World in Five Minutes, Every Day at School has recently passed 400,000 Youtube views! It’s a fast-paced five-minute film, following a class of year five and six kids as they spend the first five minutes of every day at school taking action to change the world in positive ways. It’s about getting fired up and doing something about the state of your community and the planet. The film has found a life of its own on Youtube and inspired individuals and classes to take action. The film has been screened widely at events in Australia, the UK and America. The movie is based on the book Change the World for Ten Bucks. Check out the book’s suggestions on world-saving actions here. And some of the simple, doable actions that I have blogged. This is just fabulous Tristan. Thanks for sharing it with the world. hey tristan,i like the book Nit boy and where do you find (My life and things that i made up)? remember you came to St Kevin's earlier today? have a good day! Hey, thanks for the kind words about Nit Boy. Glad you like it. My Life and Other Stuff I Made Up is available via the web by clicking on my 'Store' page or it should be in big bookstores or you can ask for it in a store and they will order it for you or it might be in your library. Hope these work! Nanoo, nanoo. T.